We’re here to make your winter stress free! 1. Schmitt’s Landscape has been proudly doing residential snow for 30 years! 2. We preserve your driveway and landscaping by only using snow blowers and shovels! Zero Tolerance Contract or Seasonal Contract. Offer high quality, dependable Snow Removal Service, with great communication, at a fair price. Call/Email now to reserve spot on our snow route for this winter! Limited space available! Reliable, honest, quality commercial snow plowing and de-icing services for Chicago’s Western suburbs. Schmitt’s has been providing businesses throughout Wheaton, Northern Naperville, Northern Aurora, Downers Grove, Warrenville, Winfield, Batavia, Glen Ellyn and surrounding communities with exceptional, reliable commercial snow removal services for over 30 years! 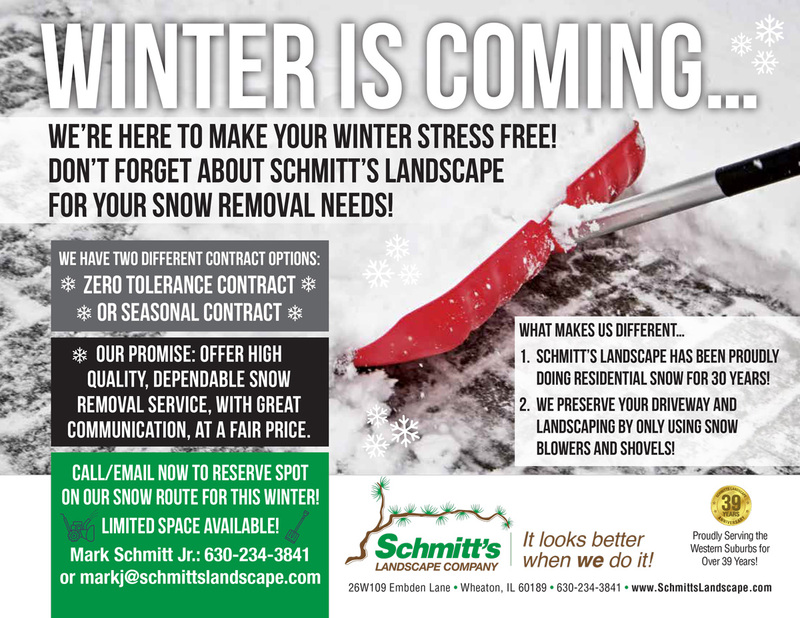 Let Schmitt’s Landscape Company handle your commercial snow plowing and commercial snow removal services this winter. With fast, convenient, trustworthy and reliable service, Schmitt’s is the perfect commercial snow plowing services provider. Our dedicated snow and ice management crews are on call throughout the winter in the Southwest Chicago suburbs, including holidays, to serve you. With over 30 years of commercial snow removal and ice management services under our belt, you can’t go wrong with Schmitt’s Landscape Company.